This is done using the RENAULT Card; see the “RENAULT Card” information in Section 1.
if the RENAULT card battery is weak, flat, etc. vehicle located in a high electromagnetic radiation zone. to use the interior door locking/unlocking control (refer to the following pages). Turn screw 2 with the door open (using the end of the key) and close the door. This means that the doors are then locked from the outside. The doors may then only be opened from the inside or by using the key in the front left-hand door. Switch 3 controls the doors, boot and, depending on the vehicle, the fuel filler flap simultaneously. If a door or the tailgate is open or not closed properly, the doors and tailgate lock/unlock quickly. 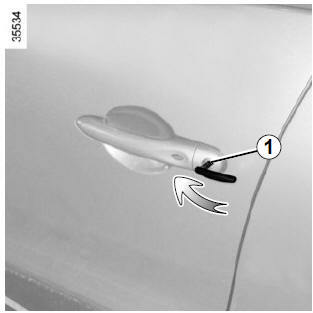 If you need to transport objects with the boot open, the other opening elements can still be locked: with the engine stopped, press switch 3 for more than five seconds to lock the other opening elements. For example, in the event of a discharged battery or the RENAULT card temporarily not working, etc. With the engine switched off and an opening element (door or boot) open, press and hold switch 3 for more than five seconds. When the door is closed, all the doors and the tailgate will be locked. Unlocking the vehicle from the outside is only possible with the RENAULT card in the vehicle's access zone or using the key integrated in the RENAULT card. 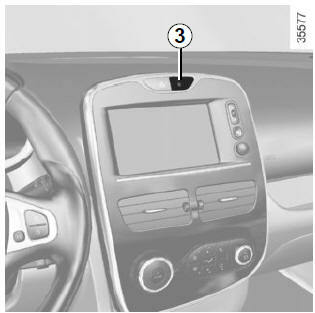 After locking/unlocking the vehicle using the buttons on the RENAULT card, "hands-free" locking and unlocking is deactivated. To reactivate the “hands-free” mode: restart the vehicle. indicator light off, the doors and tailgate are unlocked. When you lock the doors, the indicator light remains lit and then goes out. Never leave your vehicle with the RENAULT card inside. Driver’s responsibility If you decide to keep the doors locked when you are driving, remember that it may be more difficult for those assisting you to gain access to the passenger compartment in the event of an emergency.